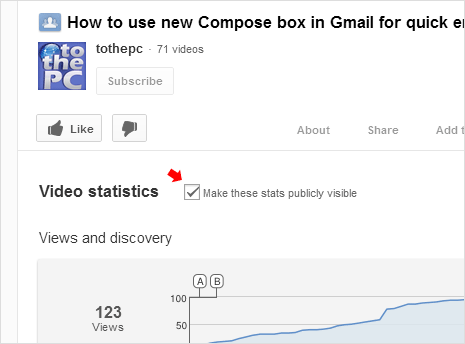 By default, any visitor can view statistics of your videos on Youtube website. Are you looking for way to disable people reading your Youtube video statistics? Video statistics button under Youtube video player allows visitors to view traffic details for that specific video. It shows number of views, key discovery events, referral websites, engagement, audience and top demographics. You can hide such information for all or specific videos on your Youtube channel by changing “Statistics and data” settings from the “Privacy” section. 1. Open Youtube website and login into your Youtube account. Once logged in, click on your profile name at top right and then click on Settings option. 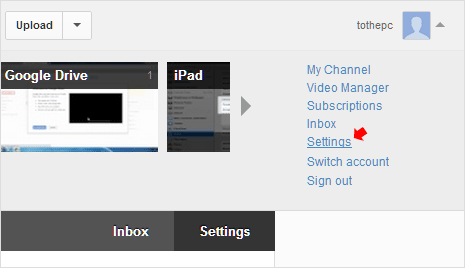 This will open “Account Settings” page of your Youtube account. 2. Now click on Privacy option under “Account Settings” section at top left. Scroll down to bottom of “Privacy” setting page and look for “Statistics and data” section. 3. 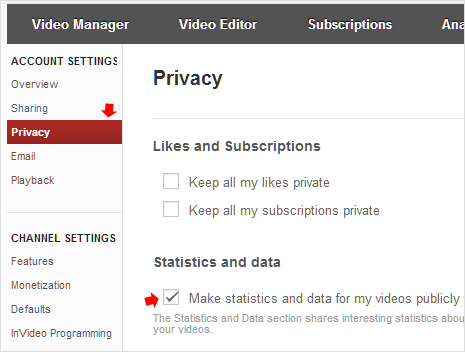 Click to uncheck (no tick) next to “Make statistics and data for my videos publicly visible by default” option. The Statistics and Data section shares interesting statistics about each of your videos with your viewers. Changing the default will change the settings of all your videos. Then click Save button at top right. This will disable display of statistics data for all videos in your Youtube channel. From now on, when a visitor clicks the statistics button under the video player it will display “Public statistics have been disabled” message instead of actual video stats. 1. You also hide stats of specific Youtube videos as against all videos in your Youtube account. While logged into your Youtube account, open any specific video for which you want to hide stats. 2. Click on Statistics button under that video player. Then click to uncheck “Make these stats publicly visible” option. This will hide stats for this specific Youtube video. You can make this change for multiple selected videos.